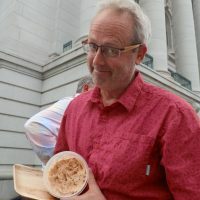 A few weeks ago at Concerts on the Square, Magic 98 fan and friend, Kurt Sonnenburg, stopped by Magic 98‘s VIP table to share his fantastic salmon spread. He and his wife, Monika, set up a brunch table to write home about! He could open his own restaurant. Every one of our guests loved the salmon spread and wanted to know how to make it themselves. Kurt promised to get me the recipe and I promised to make sure it got posted for everyone else! Kurt says that the key is the smoked salmon, and he uses the kind pictured here from Costco. Other tips: this salmon shreds very easily using two forks. 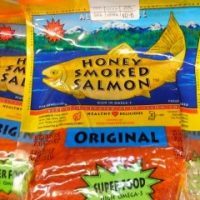 When selecting a piece of smoked salmon, it should be moist as possible, and dry smoked salmon simply doesn’t work. Lastly, carefully fold in one (1) small tub of Philadelphia Cream Cheese with Chives (Kurt pre-whips it with a fork before adding to mixture) and serve with plain crackers. Enjoy! And be sure to thank Kurt next time you see him at Concerts on the Square! Hear Kathryn Vaughn on Magic Sunday Mornings from 7AM to noon.